We’re located in rural Canistota, South Dakota! 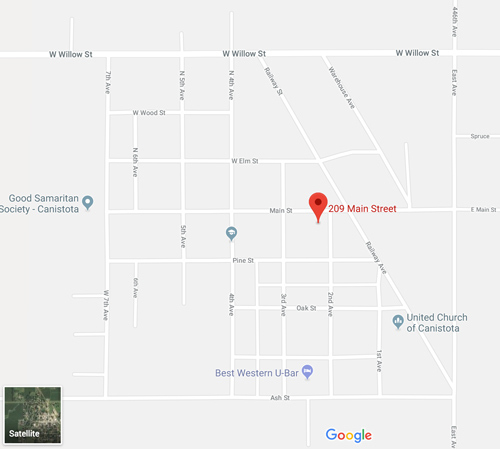 Located in the small, rural community of Canistota, South Dakota, the Ortman Clinic is easily accessible from Interstate 90, Highway 42, and Highway 81 (driving directions). Should you be arriving by plane at the Sioux Falls Regional Airport, taxi service is available. Services familiar with Ortman Chiropractic patients include: Canistota Area Bus (1-605-421-1042), Black and White Cab (1-605-332-1234), and the Sioux Falls Taxi (1-605-310-7909). Please call your preferred service in advance to make arrangements. The Ortman Hotel, 1-800-801-3132, was built in 1929 by Drs. Amon and Noah Ortman and is listed on the National registry of Historic Places. Amenities include direct access to the Ortman Clinic, Wi-Fi, Cable TV, two whirlpool rooms, two family suites with full-sized kitchens, a large gathering area, a shared kitchen area, Suzie B’s Café, the vintage Otis Elevator, on-site laundry, and discounts on Town N’ Country Shuttle are also available. If you stay here, please instruct your family and friends to call you at 1-605-296-3131. Please make a visit to www.ortmanhotel.com for more detailed information about the hotel. The Cameron Inn, 1-605-254-6001, was built by Dr. Ryan Ortman and is located approximately 1.5 blocks east of the clinic. If you stay here, please instruct your family and friends call you at 1-605-296-3555. Town N’ Country Motel, 1-605-412-4778, is located ½ block southeast of the clinic. Amenities include private, in-room kitchenettes, walk-in showers, and all rooms are ground level with an exterior entry. The Canistota Depot Inn, 1-605-296-3447, is located behind the clinic to the south. Amenities include private, in-room kitchenettes, cable TV, Wi-Fi, and guest laundry. If you stay here, please instruct your family and friends to call you at 1-605-296-9007 or 1-605-296-9008. 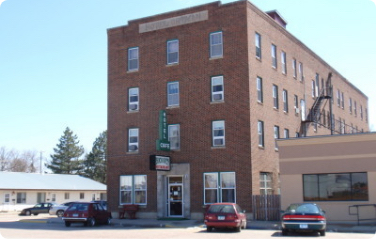 The Stensaas Motel, 1-605-296-3207, is located ½ block south of the clinic. The U-Bar Motel, 1-800-566-8227, is named for the Ortman cattle brand and is located approximately 4 blocks south of the clinic. Daisy’s RV Park, 1-843-241-1567, is located approximately 3 blocks south of the clinic, and features six RV spots with full water, sewer, and electrical hookups. Shower and laundry access is also on-site. Triple Play Storage and Campground, 1-605-351-4468, is located approximately 5 blocks southeast of the clinic. If you have an RV and are passing through, they this may be for you. The SD Lake Vermillion Recreation Area, 1-605-296-3643, is located approximately 7 miles east of Canistota. Get an adjustment, catch some fish, and roast some marshmallows!